This is the page for all who eat what they grow! I purchased my Sunglow Greenhouse about 15 years ago and to my amazement it has lived up to all the claims that were made to convince me that this was the product to buy. Even during the power outages the Sunglow Greenhouse's insulated construction has kept our treasures safe. 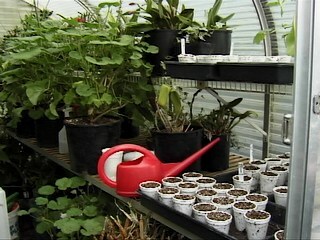 Another wonderful thing is that through all of the weather the greenhouse still has no leaks, tears, or bends. The only thing that I have repaired since installation is the stripping around the door, which I got from a Sunglow dealer. I will attempt to show you a little of the greenhouse but it is the time to get starts ready and the greenhouse is full. The room to move is minimal but soon I hope to be able to show you step by step the tranfer to the garden from the greenhouse. My orchids are not all in bloom now but most are later on the paths and some of the cats will be in bloom so you will get to see some. Orchids bloom mostly in the winter months and need protection from the sun in the summer. That is why it will be a better time to show you when the starts are gone and the orchids are more open. Since my garden page needs summer to speed up to give you a blow by blow of our replanting the starts, I will instead, be able to show you a treat. Here is some of that creativity that I told you about. 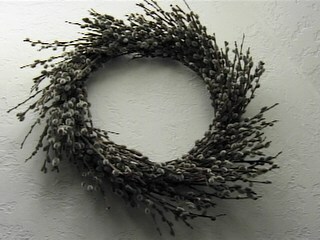 This wreath was made by my wife Stephanie. She has taken special care in wraping the wire with a brown tape to hide the wire. Also the whole process takes several hours and you have to have a pussywillow tree. The pussywillows are in bloom so get out there and take a stab at it. If you need any encouragement or information please email me and I will try to go into more depth on whatever subject you are refering to. Every week there will be a new posting of interests of the GREENHOUSEGOURMET so be sure to bookmark for easy access. There are no questions this week but if you do have any questions please let me know and I will respond to you over the web page or if you specify I will resend to author. UNTIL NEXT WEEK THIS IS GREENHOUSEGOURMET SAYING YOU ARE WHAT YOU EAT!